Foot pain is very common. About 75% of Americans have foot pain at some time in their lives. Most foot pain is caused by shoes that do not fit properly or that force the feet into unnatural shapes, such as pointed-toe, high-heeled shoes. Helps maintain balance by adjusting the body to uneven surfaces. Because our feet are very small compared with the rest of the body, the impact of each step exerts tremendous force upon them. This force is about 50% greater than the person’s body weight! During a typical day, people spend about 4 hours on their feet and take 8,000 – 10,000 steps. This means that the feet support a combined force equivalent to several hundred tons every day. If we exclude medical conditions and high-impact exercises, Ill-fitting shoes are the biggest cause of foot pain and most other foot conditions. Further, high-heeled shoes concentrate pressure on the toes and can aggravate, if not cause, problems with the toes. The toe separation exercise is a perfect fit for people who spend a lot of time on their feet, especially if wearing ill-fitted shoes. The exercise is designed to return mobility to the toes and stretch the foot muscles. This exercise consists of separating toes, with the help of the hands as shown on the image. Just sit down in a comfortable position, with one leg under the other. Use both hands to separate each pair of toes one by one, and then switch to the other leg. 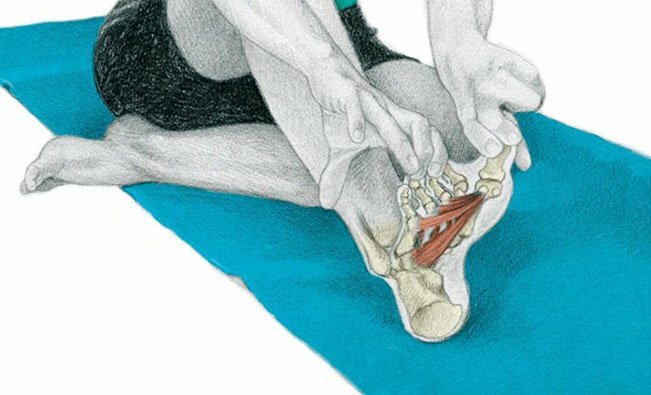 This exercise is especially recommended when your footwear presses upon, or at least immobilizes the toes, and so it is important to regain the lost mobility. Walking around barefoot, especially on the sand at the beach, can be a pleasant and valid alternative, although not as specific or as strict as moving each toe individually. Keep in mind that, footwear should never harm the toes, ankle or any other part of the body, because a poor support has repercussions in many other areas (the knees, the hips, the spine, etc.). Alternate shoes. Don’t wear the same pair of shoes every day.